When soccer mad Ken went along to St. Kevin’s Football Club with his then seven-year-old son Greg he didn’t realise that the last place he would be standing was on the sidelines. 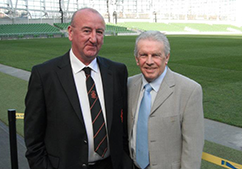 Over 30 years later, the Santry man has been instrumental in transforming the club into the renowned nurturer of footballing talent it is known for today. Liam Brady, Damien Duff, Euro 2016 goal scoring hero Robbie Brady, Jeff Hendrick and Jack Byrne have all benefited from the club’s grassroots coaching that Ken has been a passionate driving force for. “I have a passion for seeing all the boys doing well; whether that’s going on to play professionally or just playing well during a match,” said Ken. It is thanks to a brainchild of Ken’s that many budding, young footballers have been snapped up by English Premier League clubs and are now playing professional top flight football. ‘The Academy Cup’ was born. Schoolboys playing for Barcelona, Real Madrid, Arsenal and Celtic, to name a few, have all made the now annual pilgrimage to play against St. Kevin’s footballing protégés. Paul Noone, who nominated Ken as a worthy sporting champ winner, added: “Many players wouldn’t be where they are now without Ken’s dedication.